Since the publication of Kotler's Marketing Management in 1967, marketing has witnessed a dramatic increase in academic involvement. Today there is an extensive range of publications available covering a variety of topics - from cognitive studies of consumer behaviour to organising international distribution - but the 4 Ps, based on the marketing mix model, remains as the dominant theoretical base. 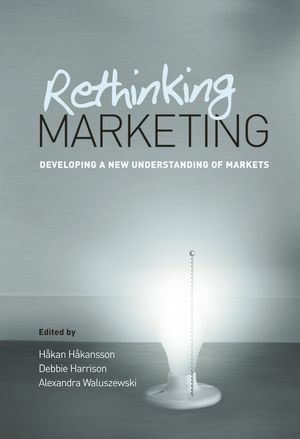 Rethinking Marketing demonstrates a misfit between the existing theoretical toolbox and important development trends in the marketplace. Hakan Hakansson is the NEMI professor of International Management at the Norwegian School of Management, BI. He is also one of the founder members of the international IMP Group. Publications include a number of articles in international journals as well as a number of books. Debbie Harrison is an Associate Professor in the Department of Strategy and Logistics at the Norwegian School of Management BI. She has published articles in the Journal of Business Research, Technology Analysis and Strategic Management, and the Journal of Management Studies in the areas of network change, path dependence and relationship dissolution. Alexandra Waluszewski is Associate Professor at the Department for Business Studies and the STS Centre, Uppsala University. She has published several studies within both the IMP and STS research traditions and is also a free-lance writer. Chapter 3. The ‘Market Form’ Concept in B2B Marketing (K. Blois). Chapter 9. Developments on the Supply Side of Companies (L-E. Gadde and G. Persson).